Professional bemoaners not only lambaste the American housewife, they also explain sympathetically how she deteriorated into being part drudge, part soap-opera addict—and why, when she goes to a party, she’s likely to drink too much. The housewife has been told she has been grievously wronged by civilization’s social pattern—her budding premarriage talents crushed by child care and domestic routine. She once had the makings of a brilliant career woman, but now here she is, her hands puckered by dishwater, her lipstick chewed off—-if she had time to put it on. Cut off from the world’s stimulating work. Her capacities atrophying. Bored. Trapped. The experts’ advice: she must fight hard to keep her individuality from drowning in this morass of wife- and mother-hood. Everything is recommended, from night courses in French to making ceramics. This supposedly tragic situation brings a few comments from one Jeanne Ludlow, housewife. Mrs. Ludlow, thirty years old, claims she is as typical an American housewife as you can get. The Ludlows live in a suburban Philadelphia home, have four children under eight, have been married nine years. As far as Mrs. Ludlow is concerned, the experts have it all wrong. “Who’s kidding whom?” she says. “In the first place, a woman’s premarriage talent never existed in ninety per cent of women.” Jeanne Ludlow considers herself part of that ninety per cent. Her case history: an average American girl with her share of dates, two years of college—in Jeanne’s case, Wellesley—two years of a nice, clean job in securities, then marriage. Before marriage, Jeanne liked a good time, had no special talents, and luckily it never occurred to her she was likely to discover the cure for cancer, or that she could push Helen Hayes off the stage and take over if she tried hard enough. Her two-year job developed, she thinks, only one small side of her personality. “The truth is,” she says, “before marriage I was nothing. 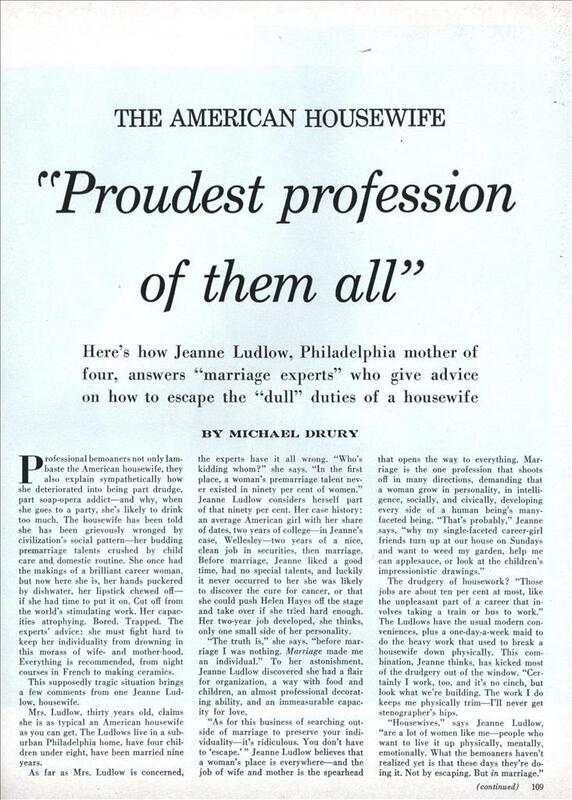 Marriage made me an individual.” To her astonishment, Jeanne Ludlow discovered she had a flair for organization, a way with food and children, an almost professional decorating ability, and an immeasurable capacity for love. The drudgery of housework? “Those jobs are about ten per cent at most, like the unpleasant part of a career that involves taking a train or bus to work.” The Ludlows have the usual modern conveniences, plus a one-day-a-week maid to do the heavy work that used to break a housewife down physically. This combination, Jeanne thinks, has kicked most of the drudgery out of the window. “Certainly I work, too, and it’s no cinch, but look what we’re building. The work I do keeps me physically trim—I’ll never get stenographer’s hips. COPING WITH FOUR CHILDREN has taught Jeanne to think fast, move fast. She feeds, bathes, and puts eight-month-old Mark to bed, then in ten minutes bathes and dresses from skin out for a party. House rule: a baby sitter every Friday night, whether there’s anything planned or not. When Jeanne was a child, her family had a maid, cook, and laundress; her mother never did any hard work. Jeanne had never co-operated with her family, had known no family problems. She feels her own pattern offers the chance for growth she finds so exciting. AN AFTER-LUNCH SIESTA while the children nap keeps her posted. Her curiosity developed by her variegated life, Jeanne subscribes to three news magazines. She also reads several general magazines and devours everything on decorating. BACK-YARD BIRTHDAY PARTY. Jeanne relives her own childhood, and learns about adults from watching the children. The Ludlows divide their days into “kiddie time” and “grownup time.” The dinner hour, a grownup time, Hank and Jeanne spend together; the children eat earlier. “ME TIED DOWN by marriage? Not since I learned to skip the jobs that make me feel self-sacrificing. If I’m happy, it spreads through the family.” Jeanne and Hank won first prize in a Philadelphia dance contest last spring. JEANNE DISCOVERED her green thumb two years ago while trying to spruce up their yard. Since then she’s won two horticulture awards. A GIFTED PIANIST: It pianist, Hank also writes music for the yearly musical comedy staged by the University of Pennsylvania’s Mask and Wig Club. Jeanne, fascinated by Hank’s music, now writes lyrics for his song auditions. Actually I agree with the article, what better or more important job than a mother, hey what more important job can there be than building a human being, body and soul, from the ground up? Wow. 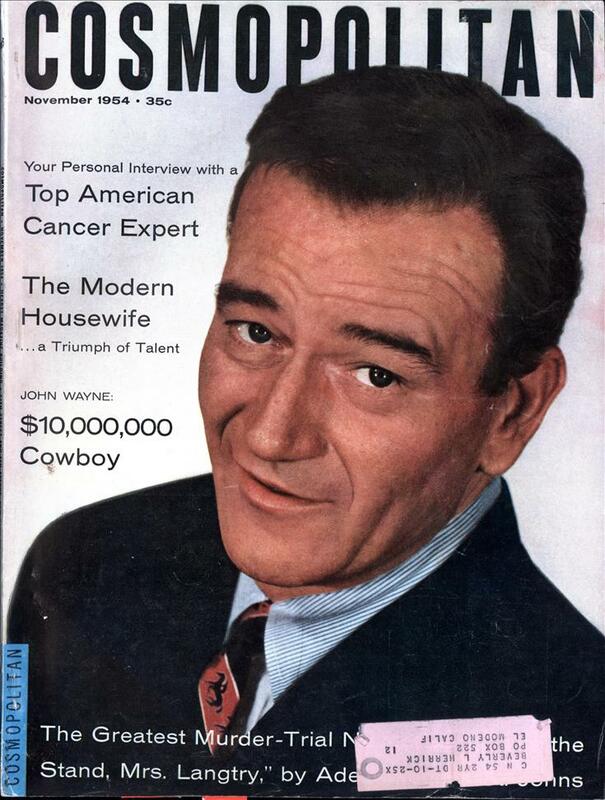 Compare this to Cosmo today. I don’t think there’s a magazine on the shelves more detrimental to women.